When the warrants were issued, both suspects were already in custody of the Mecklenburg County Sheriff’s Office on unrelated charges. 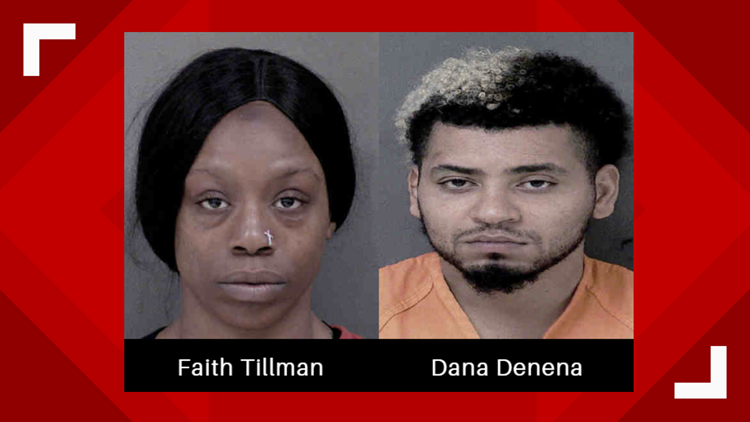 CHARLOTTE, N.C. — Detectives with the Charlotte-Mecklenburg Police Department have charged 26-year-old Dana Denena and 25-year-old Faith Tillman for their involvement in various car break-ins in January. On January 20 at 12:13 p.m., a victim told police an unknown person entered their vehicle and stole property on the 10300 block of Cedar Trail Lane. On January 23 at 9:06 a.m., a victim said someone entered their vehicle in the 10400 block of Cedar Cedar Circle Drive and stole property. On January 26 at 5:37 p.m., a victim told police an unknown person entered their vehicle in the 7600 block of Cedar Point Lane and stole property. After investigating several leads, South Division Detectives obtained information identifying Denena and Tillman as suspects. Detectives obtained warrants for the two for breaking and entering into motor vehicle, financial transaction card theft, financial transaction card fraud, and larceny. When the warrants were issued, both Denena and Tillman were already in custody of the Mecklenburg County Sheriff’s Office on unrelated charges and served with the outstanding warrants. Anyone with information is asked to call Detective Grass at 704-336-3030 or Crime Stoppers at 704-334-1600.